To evaluate the effectiveness of cranial electrotherapy stimulation (CES) on patients’ anxiety levels. An open label retrospective analysis of 197 patients who were seen at a mental health clinic between January 1989 and January 1995. 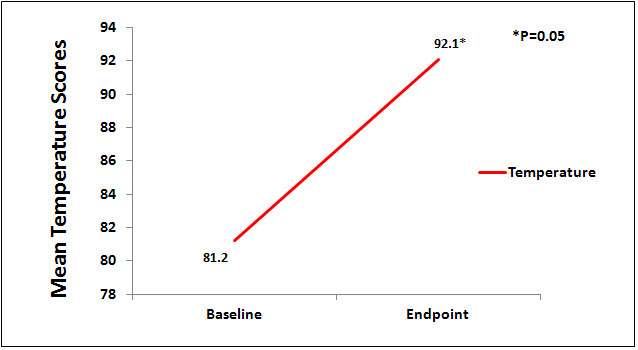 The primary effectiveness endpoint was the change from baseline in the last post-treatment scores on the Numerical Rating Scale (NRS) for anxiety, along with physiological measurements of electromyogram (EMG), electrodermal response (EDR), and finger temperature (FT) taken at the last therapy session. • Subjects who had CES treatments for anxiety from January 1989 to January 1995 and had completed the baseline and final evaluation post-test measures. • Diagnosis of anxiety was verified by a doctoral level clinical psychologist and scores on the Numerical Rating Scale for anxiety, EMG, EDR, and finger temperature assessments. An Alpha-Stim CES treatment was done for 25 minutes at a comfortable current setting up to 500 µA at the beginning of a therapy session. 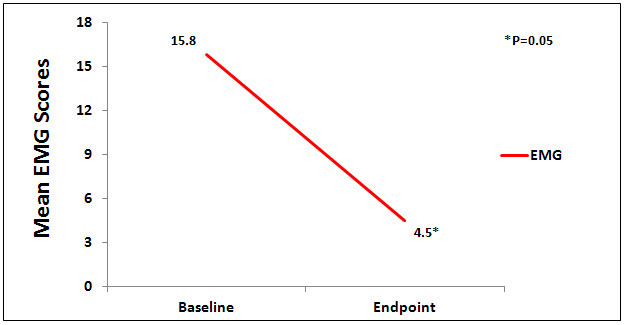 Measurements of outcome variables were taken before and after treatment. The final post-treatment measurements were taken at the last treatment session. The level of significance was set at p<0.05. A numerical rating scale (NRS), 0-100, with 100 being the “highest amount of anxiety they can imagine” and 0 being no anxiety. The NRS has established reliability and validity for measuring anxiety (Davey, 2007) The following physiological indices of anxiety were also measured; electromylegram (EMG), Electrodermal response (EDR), and peripheral temperature. There were 197 patients who began treatment. Of those, 182 completed treatment: 55 males and 127 females. The average age was 35.6 years. Baseline measures on the anxiety Numerical Rating Scale. EMG. EDR and finger temperature were taken prior to the first CES treatment at the first therapy session. Data were analyzed using paired t-tests scores. 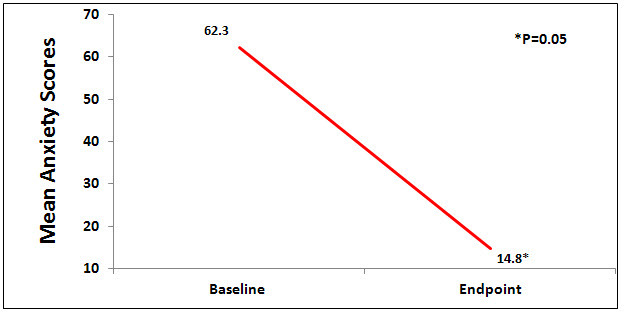 Subjects had significantly lower scores on the 0-10 numerical rating scale for anxiety (p<.05), significantly lower EMG scores (p<.05), significantly lower EDR scores (p<.05) and significantly higher finger temperature scores (p<.05) at post-test from baseline, with all factors indicating and cross confirming less anxiety (See Figure 1, 2, 3 and 4). Figure 1. Mean anxiety scores over time on the 0-100 numerical rating scale (NRS). Figure 2. Mean scores over time on EMG as an objective physiological measure of anxiety. Figure 3. Mean scores over time on EDR as an objective physiological measure of anxiety. Figure 4. Mean scores over time on peripheral temperature as an objective physiological measure of anxiety. Strengths of this study are; it was adequately powered with a large N of 197 subjects, both subjective and objective physiological measures of anxiety were used, and an analysis of the data was done comparing outcomes by the therapist’s level and type of training in order to determine if the effect was from CES or from the therapist (there were no significant differences in outcomes by level of training of therapist). This was a retrospective study and it has the following limitations; lack of controls; lack of a standard protocol for CES treatments that includes number of treatments, the current level and length of treatment, and for where treatments were done – clinic, home or both places. However, the findings of this study that CES significantly decreases anxiety is consistent with other Alpha-Stim CES studies that found CES significantly decreases anxiety.